I must apologise that my blog postings have become rather sporadic of late. In addition to my work as a male pole dancer, I’ve been super-busy as a photographer these last few weeks and it eats into the time I’d normally spend cobbling stuff together. Next week I will be away shooting a conference – maybe an article will present itself from that. With Christmas looming fast, it may be New Year before things get back to normal, but do keep your eyes peeled as I have a few subjects I’d like to address in the coming weeks. As I may have mentioned previously, I tend not to get work directly from newspapers these days. 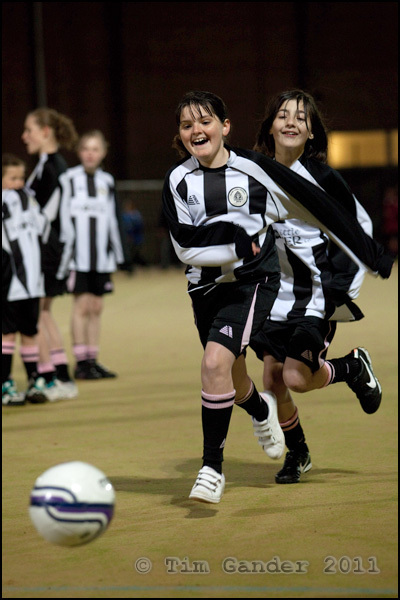 The pictures I take are usually commissioned by corporate clients, but my roots are in newspapers, so it wasn’t without a nostalgic twinge of pleasure that I got a call to take some pictures for The Sun for a feature piece on Frome Town Football Club’s girls’ team training. Typical of a press job it happened in terrible conditions; cold, dark, and the rain was coming down sideways. 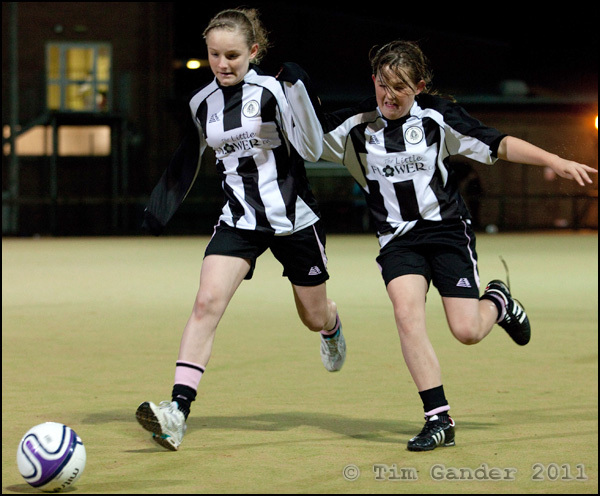 The girls train at the Frome Leisure Centre all-weather pitches, which are floodlit and I have to say that although the lighting isn’t perfect, it was better than some I’ve experienced. In addition to the adverse weather, I feared my Canon 5D MKII wouldn’t be up to the task of sport action, and it’s true to say that since I no longer own a 1D-series body it’s not so easy to catch action with the 5D’s 3.5 frames per second, but that’s where timing and a bit of extra thought comes in. Under the conditions, I couldn’t just “spray and pray”. I had to find the angle, see where the pools of uneven light were at their brightest, and work hard to keep focus and capture the peak of the action. In addition, I don’t think I’ve shot football of any description in over a decade, which added an extra little frisson to the evening’s assignment. That and the fact this was for The Sun, not a local paper that would be grateful for anything recognisable as football. I shot the standard team shots and portraits of Julie Peet, the poor, suffering coach who had to put up with the rain, the cold and the fact that these girls are… let’s just say full of spirit. It was like watching a cat-herd at work. I’ve posted some of the results here, including the “alternative” team shot which I couldn’t resist as a more fun alternative to the standard team photo. In the end, the job was a pleasure. These girls have incredible spirit and humour to do what they do in a sport dominated by boys. They deserve to do well, and who knows? Maybe I have pictures of some future stars! Community Care folds in favour of online. It might please the accountants, but is it smart in the long-term to close print publications in favour of online? For some years now I’ve worked on commissions for Community Care magazine, but this will be no more since the print magazine has been taken out the back and shot by its owners, Reed Business Information. This is a real shame because Community Care was a magazine which although aimed at a fairly un-glamorous niche (social care and social work issues), it was a well-considered publication, and one of the seemingly few non-glossy mags that used photography in a sensitive, appreciative, engaging way. 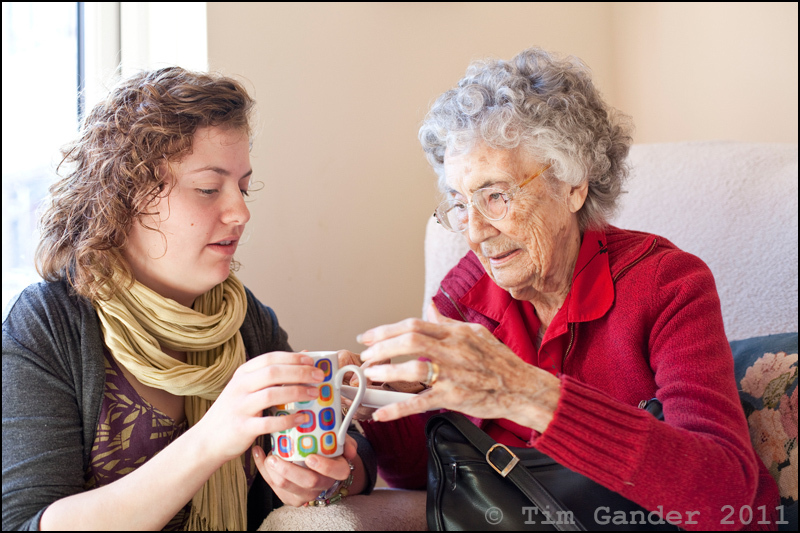 I enjoyed working with carers and their clients. Maybe that can continue with the online editions. However, RBI have taken the decision to close the print title in favour of its online offering, which isn’t half as rich with engaging images. This may of course change, and it may be that they decide to spend something on original photography for the e-version. As things stand now, the web edition images are often rather clunky stock images or low-quality snaps used very small. There seems to be a view that if an image is used at all, it should be a very distant second cousin to the text, but it’s no secret that a good image used properly will draw more eyes to an article, and isn’t that what publishers want? It all adds to the hit stats and that seems to interest publishers, even though the Community Care site appears to carry no advertising other than for industry jobs and their own conferences and events. I’m not a publishing expert or industry analyst, but it would seem that by ditching the print version, RBI are happy to ditch all advertising revenues bar the jobs ads, unless they plan to introduce wider advertising to the website. Or put content up behind a paywall, which presumably care agencies would pay for based on the amount of access required. With some 3,000 online jobs ads per week, maybe this won’t be necessary, but leaves the publication vulnerable to one revenue stream. Perhaps advertisers were simply becoming uneconomical to service in a printed version, but I wonder how many of the page hits on the website were generated by the print edition reminding people that the site is there? Perhaps it’s only a fraction, but it’s one thing to read articles because a magazine drops onto your desk, quite another to stay loyal when you’re fed a magazine edition via weblink. A printed magazine is a welcome distraction for many care professionals whose working lives I suspect are increasingly dominated by time at a computer monitor. Of course I would like to hope that Community Care will still commission original imagery on occasion, but even so I have lost some great colleagues who I now know have been given redundancy notices. I won’t name them here, but they know who they are. They stayed loyal to me over the years and were always ready to show appreciation for my work. I wish them all the best for the future. Community Care may be a small-circulation magazine, but it was a good magazine with a very valuable function. I’m not sure the website will replace the role the print edition had. We’ll just have to wait and see. The final edition of Community Care magazine will be published on 24 November 2011. Sarah Wolf, aged 37, lives in Frome from where she operates as Diablo PR. I have a Nikon D40X with kit wide angle lens. What kind of pictures do you like to take? Landscapes and buildings are my favourite. They tend not to move about too much! What was your most recent picture? 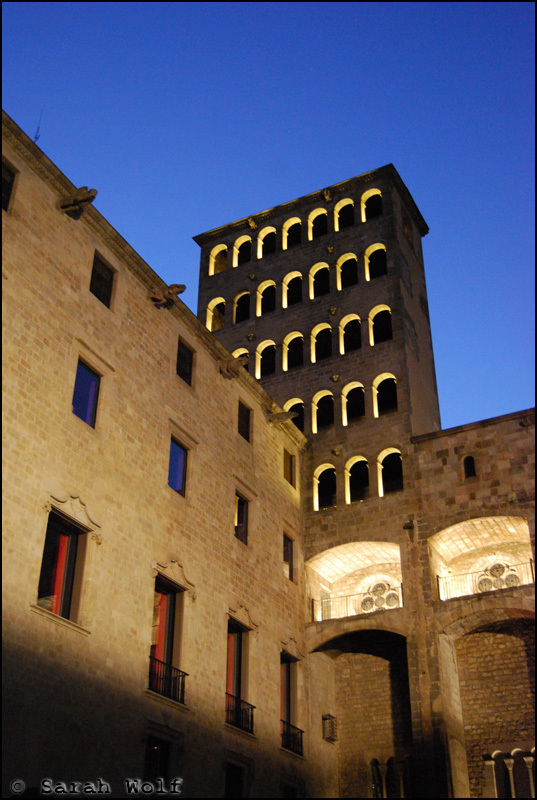 This one, a 14th century square in Barcelona – sitting with a friend, after a hot day, drinking beer, laughing and looking up at the beautiful architecture. It reminds me of that night. Sarah's Barcelona photo holds special memories. What picture are you most proud of taking? This one taken on a boat of the edge of the running rail and the sea. 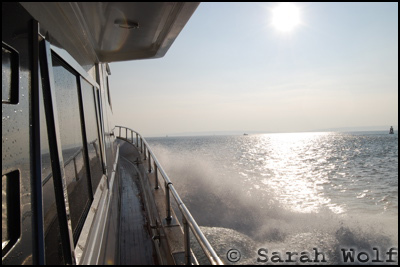 We were exercising the engines on a 50ft super-yacht in the Solent for a client. It was a bitterly cold winter’s day – we were all wrapped up in layers and oilskins. The sea was calm and I lent over the running rail, enjoying the wind and the salt when I saw the reflection of the sun on the water and just wanted to capture it. Life on the Solent can make for beautiful pictures. If you could improve one area of your photography, what would it be? I’d like to learn to take better photos of people and capture that moment of happiness, sadness, joy etc just through one shot. Pictures of people being themselves is what I’d like to learn how to take – just smiles and frowns and expressions without the people posing. Would you like to become a pro one day, or is this always going to be a hobby? If you could have taken one great photo, what would it be? I would love to have taken the planting of the Red Standard on Hitler’s headquarters – the Reichstag in Berlin – which marked the end of Nazi Germany. The man who snapped the historic shot was Soviet photographer Yevgeny Khaldei, someone who I admire greatly particularly as he was part of the propaganda machine. However, as a Jew, his career was cut short by the wave of anti-semitism in the Soviet Union and he was sacked in 1949. What drives your interest in photography? 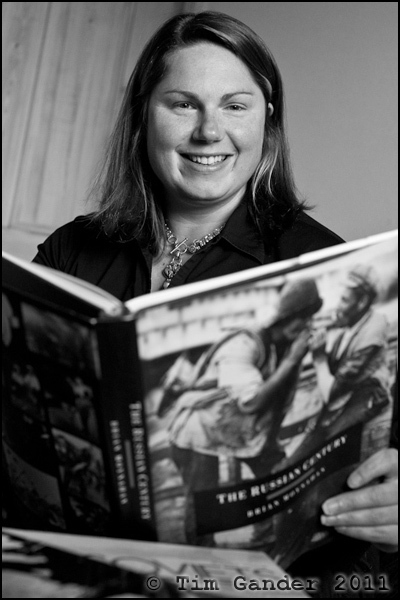 Sarah Wolf has a passion for books on historical Russian photography. One of the reasons that I adore photography is my love of war photos – particularly those taken in the Soviet Union. As a Russian student, I spent many years studying the impact of Russia, and then the Soviet Union, on the course of history. I bought many books of photography from the last 100 years and love the gritty realism of the photos of peasants working in the fields juxtaposed with the glossy photos of well-fed Party members. You can understand a country through its photography – the photos that are published and those that aren’t (but have subsequently come to light). Even though I no longer need to study Russian history, I will still spend many a happy hour looking through the photography books. A sadness of the digital age, and no longer shooting on film, is that so many photos are deleted and never see the light of day. I’m obsessive about cataloguing my life, and my family’s, through photography and have annotated photo albums going back to when I had my first camera aged eight. Now that I shoot digitally, I print less photos and those that aren’t quite perfect are deleted so quickly, whereas in the past, there was the thrill of having your films processed and seeing your shots for the first time. I even kept those photos that weren’t quite perfect which now provide an alternative picture of family holidays and events – you look in the background and see things that were accidently picked up and it gives a wider picture from that time than the story in the best shot that made it into the final album. Thank you for your time Sarah.